The exit of the bride and groom from the church is always a lot of fun for a wedding photographer. This Church Wedding Hartford was no different. The church stands in the background of the photograph, a building of red brick and white columns. The doors of the church are thrown wide open, having just had the pleasure of witnessing yet another couple achieve their happily ever after. The bride and groom pictured stepped through the big white doors of the church as husband and wife and the crowd went wild. The bride wore an exquisite satin gown that lifted up slightly to show classic white high heels, as she made her way down the church stairs. The groom wore a dark, charcoal suit, with a white dress shirt, a baby blue tie, and tan cap-toe derby dress shoes. They make a handsome pair and complement each other perfectly. The couple is jubilant in the image, overwhelmed by the love and celebration being poured out to them by family and friends. On either side of the newlyweds loved ones shout blessings and toss confetti. 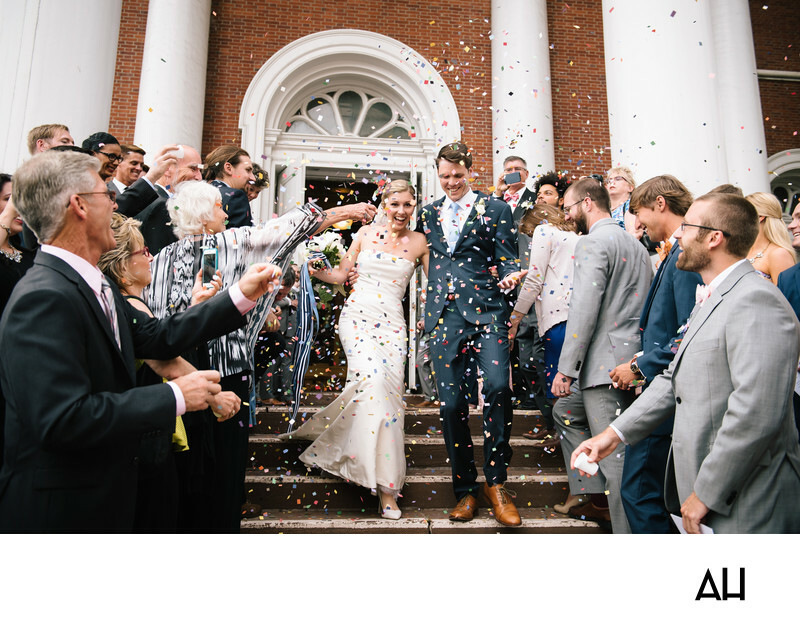 Some guests try to snap quick pictures of this Church Wedding Hartford, while others are content to simply watch the rainbow of colored confetti rain down on the delightful scene. The memory of this moment will be maintained not in their cell phones, but in their hearts. Joy is abundant in this instant, a moment when the couple first is able to walk into a group of their loved ones, as an officially unified pair.